S2 (Site 2) is an old, well and truely abondened, American glaciology base on Law Dome. I assume it was originally American as we have a diagram of it based on a report from 1958, before Wilkes was handed over to Australian administration. S2 is just over 80km inland from Casey, while S1 is just past the morain gap, 5km from Casey. 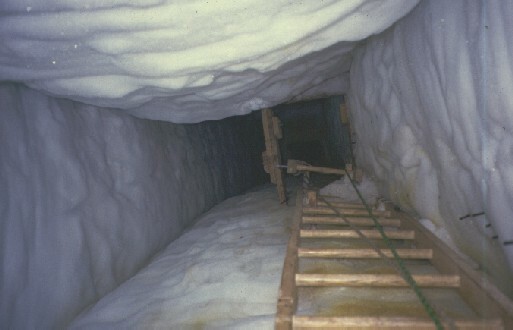 Because of snow accumulation S2 is being buried, and the once surface buildings are now buried by over 15 meters of snow and ice and is reached by a verticle shaft. Because of its historical links, and the fact there isn't much else to see on the Dome, S2 is prime jolly material. With the arrival of good weather this summer, many trips started to be planned to go there. Because of the distance, these trips came to the attention of Kingston (and because Kingston was here). There are always horror stories about how tight the tunnels at S2 are, because of different peoples ability to cope with the confinement. To make sure that people were not being endangered unacceptably, Rob Easther asked Andy Cianchi (FTO) to go to S2, assess the risks, and make reasonable safety improvements. I was one of the lucky six people to do the first trip of the 96/97 summer, along with Stephan Clark, Sam Cleland, Christian Gallagher, Graham Smith, and of course Baldrick (AC). Reflecting the relatively long distance to S2 (it's the furthest away from Casey I've been in just under 1 year), a lot of preperation went into the trip. Andy was lucky enough to have the role of trip leader, and had to do the hard work of thinking of what needed doing, and the paper work. We just had to do what he asked, the easy bit. The plan was to travel in the SAR Haggland towing a RMIT van. 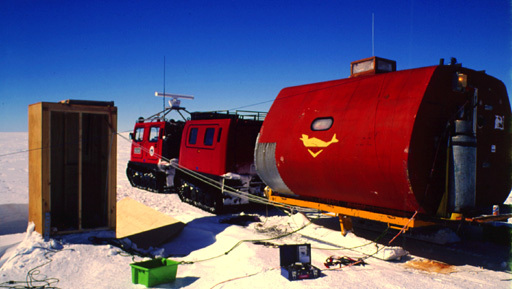 Since a RMIT uncomfortably (well for one person) sleeps 4, a polar pyrimid would be home for two of us. Catering is the most important part of trip preperation. Nothing worse than being hungry, or eating unappatising food in the field. Sam did the over catering for our trip. Being the only vego, I also threw in a few extra things, which ended up being total unnecessary. Steve and Psycho organised the gen set, electrical equipment, and tools. I helped organise some of the tonnes of climbing gear we took with. More gear was taken than absolutely needed as the trip was aimed at experimenting and finding a safe approach to exploring S2. The RMIT and SAR Hagg were organised by magic (I'm not sure who did it, but I bet dieso's helped prepare the Hagg for us). At a quick meeting on Tuesday night with Rob to talk about what exactly we were to do, it was decided to try and leave at 9am the next morining. Because of the distance, we would have to use HF radio to communicate with Casey. After the meeting a quick refresher course was given by Big Nose on communicating with a portable HF set, to the SAR Hagg 20 meters away. Speaking with the clarity and repetition needed to get messages through with HF seems silly when you don't even have to raise your voice to talk to the other people directly (especially when Psycho Psycho Psycho here here here over over over, does it). Later we were to find it's not always so simple. Like all good plans it all went to pieces. It was decided to take an Oxy Viva set with. So a last minute refresher course was held at 9am by Annetta (the Doc). After this we are all set to go; except where is Graham?? Graham has a reputation of not being ready on time when leaving station. He is very punctual about everything but going into the field! Graham mis-interpreted Andy saying it was unlikely we would get going before smoko as meaning he shouldn't be ready until after smoko, thus guarnteing we wouldn't. A phone call to his donga, with the message that we were all ready got him into action, and we left right on smoko time. The Hagg seats four in the front cab, while the back cab was full of gear. So the remaining two travelled in the RMIT van. From Casey you travel out through Penguin Pass, head up the slope to a gap in the morain line ('The Morain Gap'), and thus onto the Plateau. From here it's a few kilometers to S1, another 10km to Lanyon Junction, 40km to Blyth Junction, and finally 5km to S2. Travelling over the plateau is rough going, because of the sastrugi. Sastrugi are lines of hard compacted snow running in the direction of the wind. A small bump forms a blizz tail behind it, which then grows. Eventually they start to get undercut and form sharp ridges. Recent snow has filled in around them to an extent, but it is still very bumpy. Until Lanyon the track tends to be across the sastrugi making it the roughest section. In sections the wind blows the snow off the underlying ice completely leaving polished blue ice. This is a very slippery surface, but there was less of it than normal. Navigation on the Dome is usually by GPS. There is a cane line which is followable in good weather until Haupt Turn Off, but from there it is very unreliable and often strays from the track programmed in the GPS reciever. In marginal weather the real advantage of the GPS is that you can follow the sastrugi more, picking gaps to get back on course, not having to stick right on the cane line and making the ride more comfortable. This isn't really possible when towing. From Casey you go out through a gap in hills behind the workshop to find a drum marker (44 gallon drums welded together and stood on end) with a toilet on top, 'The Last Dunny for 2000km'. This is a slight exageration. Soon after is the Penguin Pass sign and drum marker which marks a sharpish left turn to point you up the hill to the Plateau. The middle of the morrain gap is marked by 'Flour Drum on a Pole', which is a welcome sight when coming back to Casey in poor vis (all down hill from here!). S1 is a large drum marker with a Casey City Limits sign next to it. It has developed a slight lean in the direction of the wind. Somewhere soon after is the drum marker with the big yellow diamond sign warning of kangaroos for the next Xkm. Lanyon Junction is near the sight of the most recent Casey Airfield. Some of the old towers which had met gear and wind socks on can be seen. At Lanyon there is two towers (the old VHF repeater with solar pannels), a drum marker, and a sign to all places of immediate importance. Soon after is the turn off to Browning, called Haupt Turn Off (as it will also take you to Haupt Nunataks) which is marked by a drum marker and a sign that probably used to say Haupt (which points in the right direction!). Next is the longest haul, to Blyth Junction. Blyth used to have the other part of the VHF repeater to the Dome, and a hut called Griffo's Road House. But since it was getting buried, and the repeater never worked, it was removed over the winter. Now all that is left is a fuel dump and a Keep Left sign. 4km from here, with very little in between is S2! S2 is a few kilometer north of the Antarctic Circle and at an altitude of 1140m (in 1958). We arrived at around 5.30 in the afternoon and parked the Hagg up on the south side very close to S2. S2 is a large ply wood box, about 8 feet high, and 5 feet square, with a hatch on the top. Psycho quickly climbed it and had a look down. Since it was latish in the day and some cloud came in we decided to set up camp and make a start the next day. After the gen set was going we did take off the side of the box with an electric drill and a posi drive screw bit to see if it would give better access, which it did. Amoung things that had to be done was set up the HF antenna, put up a polar pyrimid, and get dinner going. Graham did a very good job as cook making a nice pasta dish. It was quite a cold evening at around -18degC. The sched with Casey at 7pm went very well, with both ends recieving clearly. During the cutting of snow blocks to put around the tent, Sam and Stephan decided the snow was perfect for cutting blocks for a wind break/privacy wall for the dunny flour drum. It started to get out of hand and the blocks got bigger and more square. By the final night Stephen was obsessed and had to finish it before we left. It ended up a monument, made of solid 40cm thick walls, a roof, and an arch over the westerly facing doorway. On the day we left you could walk into it, out of the 30 knot breeze and blowing snow, to complete silence and a view of the blue sky. Standing I had a good 30cm of head room! The ultimate dunny away from home. It was hard getting up the next morning as it had been very cold over night, getting down to -27degC. After toast and coffee we started to become more active. The side of the S2 box was soon off and Andy was showing us a very reliable method of setting up a static rope as a secondary rope. 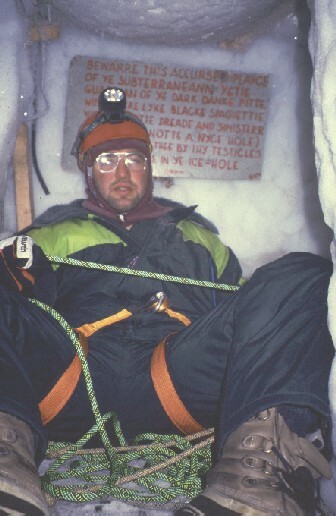 Circumstances for setting up ropes are so varied, and techniques diverse, that there is always things to learn from someone of Andy's experience. It was decided to work in rwo groups of three. The first group of Andy, Psycho, and Sam went dwon first, at around 10am. At the surface we ammused ourselves by doing some more work on the dunny and reading. At 11am the sched with Casey was due, and Graham and I waited by the HF. A bit late we heard VNJ Casey calling us quite clearly. We confidently replied to get a reply which made it obvious that we had not been recieved. After a few attempts we gave up and I tried the unit in the Hagg. This time they managed to hear me, but not understand. After two frequency changes, VNJ informed us he had not understood our message and would call again at 7pm. Ionospheric conditions at Casey are wierd, so radio black outs are to be expected. After two hours the first groups time was getting close to up and we started to get ready. While we were inside the RMIT we heard a voice outside letting us know they were out. They explained that they had set up a rope at the bottom shaft, that some work needed doing on it, and that it was quite cold. I was the first ready and had Psycho belay me down. I didn't really know to expect as I'd heard so many different stories. The first 15 meter verticle shaft is quite open, with a good ladder. At the bottom is a door into a small cramped chamber maybe 4 foor cube. The signs of the pressure of the ice are immediatly obvious with bowing and snapped timbers. 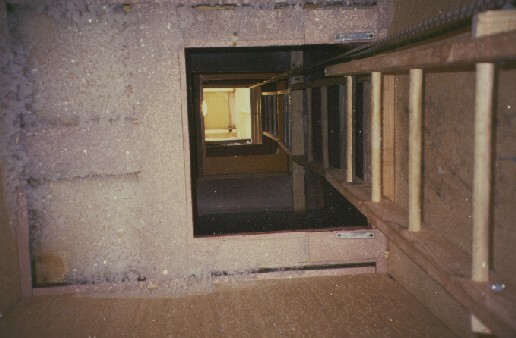 Looking up from the bottom of the first shaft. There is still a fair amount of light from the shaft, but my headlamp lit up the ice crystals I'd heard so much about. 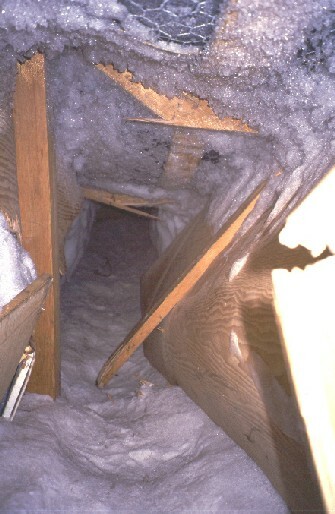 Because the temperature is constantly at around -18/-20degC, and there is no wind to disturb them, large ice crystals grow over the roof (they would get broken any where else). Some are around 3cm across. They are symetric pentagonal type shapes, and if looked at closely they have a slight pyrimid shape also. They sparkl like jewels in the light. I never got sick of looking at them, and felt bad if I bumped my head on the roof and broke any off (not to mention getting ice down the back of my colar). Looking down the first passage. From here is a narrow passage sloping gently down about 5 meters to a corner. I am keen to move on to make room for the next person, but the question is whether to go feet or head first. I chose the correct method of feet first. The final time I went down this section I had got used to the confined space enough that I slid down here like on a slippery-slide. Around the corner it continued for another 10 meters, leveling out at the end at a junction. I waited at the corner just above a tight squeeze past a piece of jutting out wood. While I waited I tried out the cameras on the ice crystals. Diagram of S2 from an old Station Year Book. Graham finally appeared, and I got him to throw down the day pack with gear, which I had left at the bottom of the first shaft. At the junction feet first had become a problem, and I wanted to turn around. I think this section has the lowest roof, with me only being able to get onto my elbows. The junction is the perfect spot to turn around, but which way to end up facing? I yell to Graham who had been down years before for directions. I go a few meters a start going up, and decide maybe it's not the right way to the deep shaft. I go back to consult with Graham who decides it isn't the right way after all. While we wait for Steve I decide to go in that direction and explore a bit. Not far along is the old living quarters, which was a Jamesway hut/tent. They are an old millitary looking fabric covered curved roof building. Like a half cylinder. Except this one has had the roof pushed down and the floor pushed up, so they meet in the middle. On the side that we could see into is a table which the roof rests on. I was latter to crawl in under the table to the other end of the Jamesway. Crawling here is quite hard as the floor is on quite an angle. Looking back up onto the top of the table is an old kero Tilley lamp that has been squashed down to a few inches high! Also at this end is an old heater, some old cooking pots, lots of other junk, and windows with not much of a view. The windows with very little view. I hear some voices so head back to the junction. Since they are on the right side I suggest they go ahead to work on the anchors and I'll follow soon. I decided to take my time following them and poke around a bit. There would not be enough room for three to work. At the junction is the storage room. 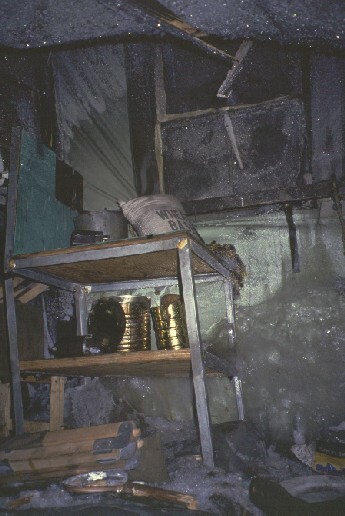 There is no sign that it was a room, just lots of food, mostly in cans, in boxes stuck in the ice walls. There is junk lying around everywhere! There once was an electric lighting system and there is old wiring around the roof, and most of the timber that can be seen is bulging in badly, if not snapped (like most roof beams). The food is really interesting, with most of it being old examples of well known brands: Allowry Butter, Cadbury's Cocoa, jam, soup, powder milk, flour, and on, and on. Heading in the direction of the second shaft the next major bend is where the generator room was. Again there is little sign that it was a room. Though I think this is the roomiest place in S2 and I can turn around easily and straighten up on my knees. This is also the messiest spot with the floor covered in cable and junk. There is less food embeded in the walls here, and more old equipment. 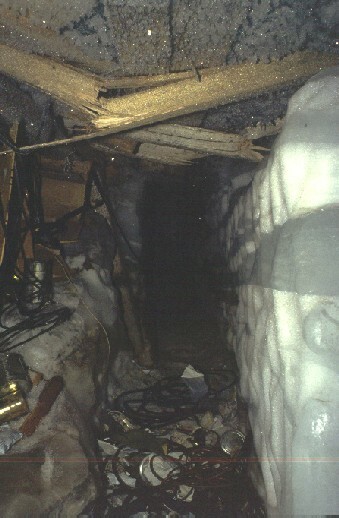 The very messy passage near the generator room. From the generator room is a long straight section to the top of the second shaft. This is also the tightest section, with a short distance having to be passed side on, on knees. 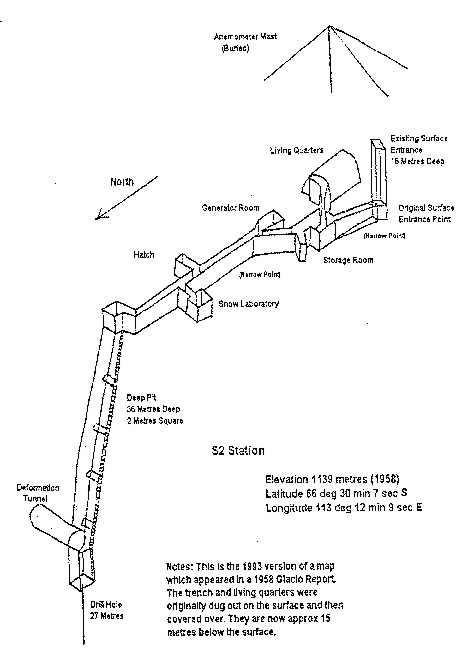 The old diagram of S2 shows two features along this section. 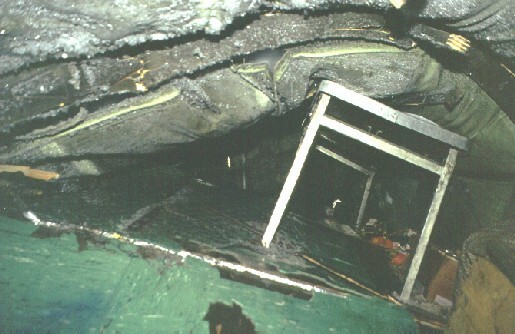 The first, marked 'Hatch', is easily recognised as a small tunnel off to the side. When we first went down I could get my head a short distance up it. Later Sam dug it out some and Andy got pushed in by Psycho. But he was not able to move around enough to see what was at the end. A bit further and on the other side is some disturbed snow and ice that might have been the entrance to the Snow Laboratory. Finally the reason for S2, the 36 meter deep shaft, is reached. Steve and Graham are putting in some snow pickets and freezing in the ice screws with water we had brought down in a thermos. There is a sign here that warns of the yetie that inhabits these deep cold places, and what it will do to us if we are caught!! Almost anything thing seems possible in such a remote and strange place. Once the anchors are set we take turns getting belayed down the ladder to the bottom of the shaft. About to Belay at the top of the main shaft. 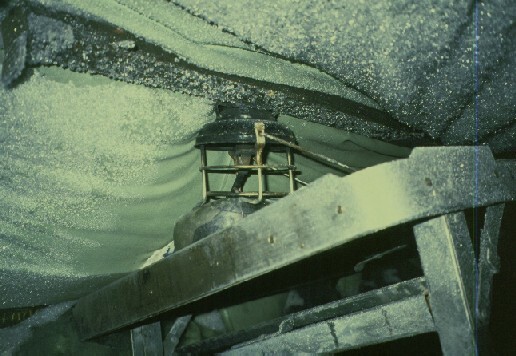 Looking down from the top of the main shaft. The shaft is 36 meter deep and slightly off verticle (well it's hard to say what it is). At the end of the long tunnel is a right angle turn and then another 1.5 meters is the shaft. It opens up to a larger area than the tunnel. It's sort of easiest to go in head first grabbing a large wooden beam and swinging around onto the ladder. The ladders are old wooden jobs with a few platforms on the way down. The shaft is around 2m square, but the platforms only take up half the shaft and have a small hole in them to go through. Down the wall is a row of nails that used to be verticle and lots of holes which are now crushed to wierd shapes (old sample holes). Guess who about to head down. After only going down 10 meter no amount of shouting can make you heard at the top. From the top with all the lights out you can just see the light of a person on the bottom. We devised a rope tug system of two tugs going down, four tugs coming up. A few meters short of the bottom is a large round tunnel off to the side. At the end is a deformation grid for measuring strain on the ice. From here is an aluminium ladder to the very bottom. There isn't much at the bottom, but it is a very eiry place. I turn my light out to see how dark it is. Very very dark. After taking some photos I give my four tuggs and head up. Once the three of us have gone down we are running a bit behind time and head out. At the surface we find the other three so concerned about us that they are fast asleep. pm in the small fiberglass caravan of our train. His body was taken back to Wilkes. splendid; we all agree to this. as a mark of repect. "Reply from A.N.A.R.E. regarding Sullivan's death requesting rapid return of field party to Wilkes for autopsy and inquest. No adequat contact with field party early in day." "Further enquiries ? A.N.A.R.E. re E.T.A. of field party - but these people? are having mechanical difficulties in that they cannot get the Herman Nelson to operate, ? 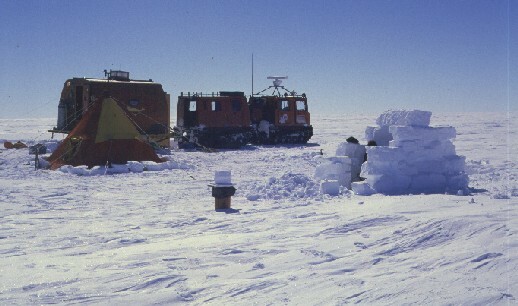 the Nodwell cannot be started in minus 40 deg temperature." Not long before the 7pm sched with Casey the others make an appearance on the surface once again. After doing the sched on the HF, with success this time, they tell us of their adventure of dragging Sam in a stretcher from the top of the bottom shaft to the bottom of the top shaft. This was to prove it was possible in an emergency. We also discuss what final minor alterations need to made on our shift at the coal face. At around 8pm we went down for the final time. Steve takes his video with to try it out in the low light conditions. When we first get down Graham and I head towards the old Jamesway and take photos in this area while Steve does some video. After doing the tourist things we head down to the bottom shaft. I belay Steve down while he ties the ladders together and cuts out some ice behind the rungs of the ladder, so one can get a foot on it properly. This took quite some time and Graham and I sat around chatting at the top. To conserve our batteries we sit in the dark for some time, but started to get bored. I found that a really good affect was to push Grahams large mag light into a core hole and the whole area of ice around it lit up a very nice blue. With all the sitting around we started to get cold and Graham decided to head to the surface. I wasn't quite as bad but was pleased when Andy appeared. He also was getting cold, and since Steve's light was visible we shouted at him to get a move on. Once he made it to the top I grabbed some gear and rope and headed out. On my way I wanted to get one more photo. So I made a quick detour to the Jamesway and got my photo of the crushed Tilly. I had left the pack with gear at the junction, which is quite cramped. My light was getting dim and I wanted to see better so decided to go for my backup mag lite. But it wasn't there. Since I'm very fond of it I have to retrace my steps. Luckily I find it under the table and get out before absolutely needing it. It was after 10pm when I leave. When I finally got out the last time I go inside and find Sam has made a very fine Indian meal. Soon after I've started Steve and Andy also make it out and have their meat version of Sams meal. Steve had used his video all the way out. By the time we have finished eating and chatting it was after mid-night. Getting out of sleeping bags on Friday morning after being in S2 till 10pm, and a strong breeze blowing outside, was tough. We slowly got going with some breakfast and coffee. There was enough blowing snow to make conditions outside uncomfortable. Packing up the tent and gen set took more effort than usual, with three of us doing it. 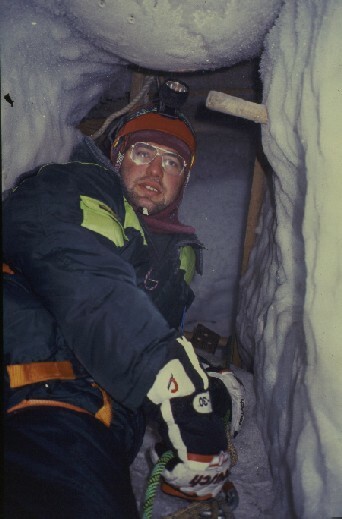 It's in cold cramped conditions like this that things get difficult, and we got a bit snappy at each other. The good thing about these conditions is that in return you don't care what someone says to you! No one was serious, and over all we were a very good team in the field and had enjoyed each others company. Andy has a great habit of getting impatient once he is ready to go. This is usually preceeded by a coffee then a smoke. After breakfast he was very predictable and said he was going out for a smoke. He must have been close enough the door to hear us taking the mickey out of him because he walked in, and with a huge grin on his face said, 'Okay lets get going!!'. The trick being to ignore him and keep up your pace, and make him wait till you're ready also (well almost). It was the usual very rough ride back. With a longish smoko break, with some nice snacks, we got back at 5.30pm, after leaving at 10.30am. We got most of the unpacking done just in time to get a drink in at Friday afternoon drink, before a great fish and chip dinner. A nice finish to a great trip.